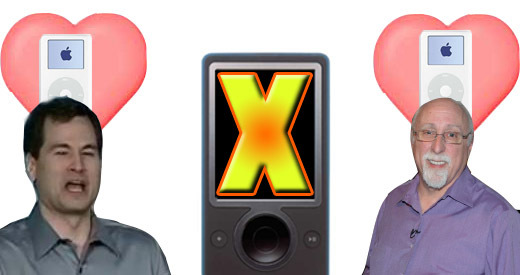 The tech world's two leading giants (the NYT's David Pogue and the WSJ's Walt Mossberg) have put Microsoft's new Zune in its place, giving the unborn player multiple kicks and jabs before proclaiming the iPod the better of the two. Mossberg starts off liking the Zune, singing praises for its good interface which he thought was "easier to use than the iPod's." Ultimately, however, he thinks it has "too many compromises and missing features to be a good choice" running back to the comfort of his iPod. He also dings Microsoft's point-based buying system (we kinda agree with you on this one, Walt). Pogue, on the other hand, starts his hatin' right off the bat, saying the Zune "can't touch the iPod's looks or coolness." He bashes the Zune for having copy protection that's "as strict as a 19th-century schoolmarm" and hates on the fact that you can't even use the Zune as an external drive. In the end, the Zune didn't stand much of a chance against the Pogue/Mossberg tag team. See the messy results for yourself below.